In this Thread, we will become familiar with the orientation of shadows, their size in relation to the object casting them, and how the alignment of the Sun, the object, and the shadow tells us much about how shadows work. The National Science Education Standards stress that geometry and light should be integrated into curricula as tools for learning about three dimensional objects. Vocabulary words which can be used to help talk about our experiences are alignment, casting, angle, and light source. The height of a tilted light source (in other words, the angle between the light source and the ground) and the size of the object it is illuminating determine the length of the shadow that the object casts. The object blocks the light coming from the source so that nothing behind the object gets any direct light. The length of the shadow is a result of how high above or below the top of the object the light source is. Imagine if the light source were directly above the top of the object. Would there be a shadow? No, not one that would be visible around the object. Twist the light source a little down from the top, and a shadow appears behind the object, but is very short. This is because as the light source moves down, the shadow is being created by the small area of the object blocking the light. Imagine straight lines coming down from the light and hitting the object. The higher the light, the less light lines get blocked by the object and hence the less shadow. Thus, the lower the light source is aimed at the object, the more the object blocks the lines, or rays, of light. The key to understanding shadows is to realize that the light source and object must be lined up in order to make a shadow appear. In fact, if the object is placed anywhere along that line, it will produce a shadow of the same length behind the object. It is only when you change the orientation of the light source that the shadow changes. That makes sense in one order: light hits an object and casts a shadow. But experiencing the connection of these fundamentals in a different arrangement is good for rooting our experiences more firmly. In other words, trying to predict where to place an object to cast a shadow at a specific location: essentially trying to locate the path of the light. We've made a brief page about solar eclipses. Solar eclipses are excellent examples of light and shadow. This Thread invites Kindergartners through second graders to continue to think about light and shadow while using their bodies to make observations. This roots our experiences by relating them to ourselves, which is fitting for this age group. It engages students in manipulating objects with a focus in mind as well as exercising balance and movement skills which are good for this age group. Teachers of second graders should consider using the grade 2-4 version of this Thread. Together, let's go outside and find a place to spread out on an area of asphalt or concrete, etc. Where are our shadows? Can everyone find his or her own shadow? Where is it? Is everyone's shadow visible? Can the teacher come and step on someone's shadow? Does it hurt to step on a shadow? How far away from the person is the teacher who is stepping on the shadow? Is it hard to reach the person from where the teacher is standing? Why are shadows so far away from their makers? Play Shadow Tag again, this time with some questions afterward. Was it hard to play this game? 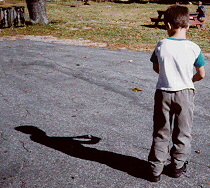 We had to be careful to watch our shadows and the person who was "It" very carefully. When was it hardest to be careful: when running towards the Sun or away from it? Why? How are shadows made, then? Now it is time to reverse our thinking. Everyone, drop your cube somewhere. Where is your shadow? Can you move your shadow so that the shadow of your hand can cover the little cube on the ground? This will at first seem quite difficult, but soon they will begin to cry out that they have done it. Helping is definitely OK.
How did you knew where to put your fingers? They will begin to vocalize in their own ways an important fact: that the sunlight is in straight lines to their hands and they need only line themselves up with the Sun and the cube to cast a shadow on it. In this way, they have figured out that one can determine the position of the light source from the angle of a shadow they can cast. Can anyone think of a way to play this game in the classroom? This Thread will examine the orientation of the Sun, ourselves, and shadows from the reverse way around. It will seem like a tricky game, but once the idea of the linear nature of light travel is experienced, we can talk more about light in the next Thread. To do so, again we will exploit this age group's fascination with mystery, team learning, and the ability to string two or more variables together into a model. Second grade teachers should consider choosing this version of the Thread over the version intended for younger (K-2) students. What has to happen before we can see a shadow of ourselves? There must be light. There is light and us, but there is something else we need to actually see the shadow. We need something for the shadow to land on. So, three things are required for shadows: a light, an object, and a surface. Is there any guideline for where the shadow should land when we are standing in the light? Does it matter where we put the light? What about in outer space? Everyone should grab one small shiny object like a new penny or an interlocking math cube, a pink eraser or a marble. Let's go outside. Find an asphalt or concrete area with a lot of space, enough that the entire class can spread out and be bathed in sunlight. Is there enough room for their shadows? You might consider timing this for between 11 a.m. and 1 p.m., when the shadows are shorter but not so short as to make this impossible. Everyone should spread out enough that they can twirl in place and not hit anyone. Next, everyone should drop their shiny object somewhere about 4-5 feet from them in any direction. Now find your own shadows and stick your arms out. Make an OK sign with your fingers, so that your shadows show a little ring or circle for your hands. Can you, without squatting, move your shadow ring so that it encircles the shiny object on the ground? They will mock this as easy at first, until they find it is very difficult. There is some kind of trick to doing this, and it will be fun watching them catch on. What has to happen before the shadow can line up with the object? What else is needed to make a shadow besides the surface (shiny object) and the thing making the shadow? The Sun. See how many can incorporate this into their struggle. There has to be an alignment of the three crucial items needed in making a shadow happen. Soon, (it takes about 3-4 minutes), they will begin crying out that they have figured it out, one by one. Ask them what they did, and they will try to explain they made things line up or they looked back to where the Sun was. It is the lining up of these objects which is so crucial to learning about how light and shadows work. If someone has managed to ring the object by luck, ask about the positions of the things needed to make a shadow. Is there any pattern? Can we shuffle from side to side and still make the shadow happen on the object? Can we shuffle forward and backward and still make the shadow happen on the object? How? Where must the Sun be in order for this to work? Directly behind our hand. Where must the object be in order for this to work? Directly in front of our hand. Where is the Sun? Where is our shadow? Have them face the Sun. Where is our shadow? Turn to the left. Where is the Sun? Where is our shadow? Is there a pattern here? What if the Sun were over there (point to the left)? Where would our shadows be? What is true then about shadows and the Sun? Shadows point away from the Sun. Do shadows point away from a lamp as well? We can play with this back in the classroom. They will want to play more with this trick once they all have caught on. You can ask them if they can get two people to circle the object at once from different positions. Break into teams of shadow makers. Can anyone make other shapes with your body to circle the object? Does everyone have to stand at the same distance from the object to ring it? How many people can you line up who are casting a shadow around the object but are standing apart from each other? Back in the classroom, let's pool what we've seen. We saw that we had to line our hand up with the Sun to make a shadow, but we also had to line that shadow up with the shiny object. We had to move our entire bodies so that the Sun was at our back to get the OK sign over the object. We found that we could also move towards it and away from it and still keep the OK ring around the object by moving our hand only slightly. Draw on the board a Sun, a person with her hand out, and the object, but do not line them up in the proper was for the person's shadow to hit the object. Will this person's shadow hit the object? Why or why not? Students should gather in the same teams that they were in outside. They should think about the question on the board and then come up with an answer. Ask the teams in turn what they think. They will hopefully mostly say no, this cannot happen. Why not? They will talk about things not being lined up. You could prod them some more by asking them if they mean you can't draw a straight line which connects them all. Draw a line that connects the three items, first asking what the order is. Sun, object, shadow....It should be a terrible looking line, with connections between points not meeting at a 180 degree angle. In other words, not a straight line. Where would I need to put the person to make the line straight? Teams can confer and answer you in rotation. Have them come up to the board and place an X where they think the person's hand should be. Different colored chalk would work well for different teams, otherwise numbers will suffice. Does everyone agree? If not, more examples like this could be done. Is this what we experienced outside? We had to line up everything to make it work! Why? What must be true about sunlight or any other light source? It travels in straight lines. For this age group, this Thread involves a quick investigation outside to exercise our powers of perception. Although this is probably a little easy for them, it is still a good idea for them to be familiar with every aspect of the shadow making process. What makes a shadow? Most will know that shadows are caused by the Sun or other light hitting an object and blocking the path of light behind the object. This is easy, right? You can make a shadow fairly easily and determine where the light source is from just looking carefully at a shadow. But can you aim a shadow at an object? Huh? Everyone should spread out enough that they can twirl in place and not hit anyone. Next, everyone should drop their shiny object somewhere about 4-5 feet from them in any direction.Now find your own shadows. Make an OK sign with your fingers, so that your shadows show a little ring or circle for your hands. Can you, without squatting, move your shadow ring so that it encircles the shiny object on the ground? They will mock this as easy at first, until they find it is difficult. There is a trick to doing this, and it will be fun watching them catch on. What has to happen before the shadow can line up with the object? What else is needed to make a shadow besides the surface (shiny object) and the thing making the shadow? The Sun. See how many can incorporate this into their struggle. There has to be an alignment of the three crucial items needed in making a shadow happen. Soon, (it takes about 1-2 minutes), they will begin calling out that they have figured it out, one by one. Ask them what they did, and they will try to explain they made things line up or they looked back to where the Sun was. It is the lining up of these objects which is so crucial to learning about how light and shadows work. If someone has managed to ring the object by luck, ask about the positions of the things needed to make a shadow. Is there any pattern? Can we shuffle from side to side and still make the shadow happen on the object? Can we shuffle forward and backward and still make the shadow happen on the object? How? Where must the Sun be in order for this to work? Directly behind our hand. Where must the object be in order for this to work? Directly in front of our hand.